The proposed project is devoted to the analysis of the Ukrainian political system after the 2014 Euromaidan revolution. 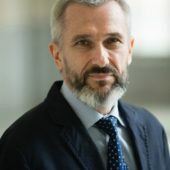 I intend to explore the decisive role of informal politics and shadow patron-client networks in Ukraine that remain under-researched topic for a long time, and investigate how a neopatrimonial democracy in which state capture is the primary gain, unexpectedly stimulates competitive politics. What has changed and remained the same in the Ukrainian politics after the Euromaidan revolution? Definitely, the Ukrainian political system has become more democratic and transparent. At the same time, the patrimonial nature and organizing principles of the political system remain the same. Surprisingly, after the Euromaidan revolution, Ukraine’s patrimonial politics are paradoxically contributing to the institutionalization of political pluralism and political competition, via a series of formal and informal power-sharing arrangements between the major Euromaidan players. The proposed project attempts to solve the puzzle of “why, where, and how” the patrimonial politics and informal institutions contribute to the democracy building and competitive politics in Ukraine? It may help shed light on the future of Ukraine’s political trajectory in domestic, regional and global perspective. Demokratiya, neopatrimonializm i global’nyye transformatsii (Democracy, Neopatrimonialism and Global Transformations). Kharkiv: Konstanta, 2006. “Rethinking Post-Soviet Politics from a Neopatrimonial Perspective,” Democratizatsiya. The Journal of Post-Soviet Democratization, Vol. 20, No. 2 (Spring 2012): 87-96. “Ukrainian Constitutional Politics: Neopatrimonialism, Rent-seeking, and Regime Change,” in Beyond the Euromaidan: Comparative Perspectives on Advancing Reform in Ukraine. Henry E. Hale & Robert W. Orttung (eds.). Stanford: Stanford University Press, 2016: 105-123.